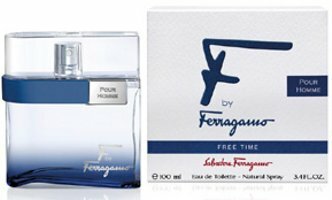 Coming in January from Salvatore Ferragamo: F by Ferragamo pour Homme Free Time, a new fresh woody flanker to 2007's F by Ferragamo Pour Homme. It is meant to be a "more informal version" of the original fragrance (2009's F by Ferragamo pour Homme Black was the evening version). F by Ferragamo Homme Free Time was developed by perfumer Olivier Polge; the notes include pink pepper, lemon, ginger, cardamom, white cedar, musk and vetiver. The notes sound perfect to me. I haven´t truly liked a ferragamo since the original Ferragamo for men. My only concern would be that this sounds too light. Perhaps this would be a great summer fragrance then. There are quite a few I haven’t tried, but I haven’t liked anything by Ferragamo either. The name of this one just cracks me up! What do you associate it with? I have so little “Free Time” that I am compelled to buy this just because of the name! hehehehehe. LOL…yes, I want free sushi! I don’t know if it is that I associate it with anything at all, it just sounds odd in a perfume name. You wouldn’t expect to see “F by Ferragamo Pour Homme Working Hours”, after all. Mind you, I don´t speak french. This is just speculation based on thousand of awful perfume names that look as the result of poor machine-translations. And Loisir is quite a good sounding name, n est pas? I think Ferragamo is running out of names. F BLACK – THE GOOD NEWS IS, WOMAN HAVE GONE OUT OF THEIR WAY TO TELL ME HOW GREAT I SMELL. THE BAD NEWS FOR ME IS, IT’S LIKE SENDING AN ALCOHOLIC INTO A BAR AT HAPPY HOUR. I LOVE IT!